Open Repositories 2018 is now calling for proposals around the theme of Sustaining Open. Research and Cultural Heritage communities have embraced the idea of Open; open communities, open source software, open data, scholarly communications, and open access publications and collections. These projects and communities require different modes of thinking and resourcing than purchasing vended products. While open may be the way forward, mitigating fatigue, finding sustainable funding, and building flexible digital repository platforms is something most of us are striving for. Submissions this year should focus on the how, why, and what it will take to make open sustainable. This year there are no separate interest groups for the different repository systems, instead if your 24×7 or presentation submission is related to a specific repository system please indicate so in your proposal. Presentation proposals are expected to be two to four pages (see below for submission templates). Successful submissions in past years have typically described work relevant to a wide audience and applicable beyond a single software system. Presentations are 30 minutes long including questions. Discussion Q&A proposals are expected to be two to four pages (see below for submission templates). This is your opportunity to suggest members of the community to join in a Q&A discussion on various proposed topics. This is meant to be a deep-dive into why a decision was made, how projects got started, where an idea came from, or anything else that you want to know more about. Imagine this as a 45 – 90 minute grilling at a cocktail party but on a stage in front of your peers. Q&As may take an entire session or may be combined with another submission. This session will not be video recorded. 24×7 presentations are 7 minute presentations comprising no more than 24 slides. Successful 24×7 presentations have a clear focus on one or a few ideas and a narrower focus than a 25 minute presentation. Similar to Pecha Kuchas or Lightning Talks, these 24×7 presentations will be grouped into blocks based on conference themes, with each block followed by a moderated question and answer session involving the audience and all block presenters. This format will provide conference goers with a fast-paced survey of like work across many institutions. Proposals for 24×7 presentations should be one to two pages (see below for submission templates). 24×7 presentations are 7 minutes long. We invite one-page proposals for posters that showcase current work (see below for submission templates). OR2018 will feature physical posters only. Posters will be on display throughout the conference. Instructions for preparing the posters will be distributed to authors of accepted poster proposals prior to the conference. Poster submitters will be expected to give a one-minute teaser to encourage visitors to their poster during the conference. 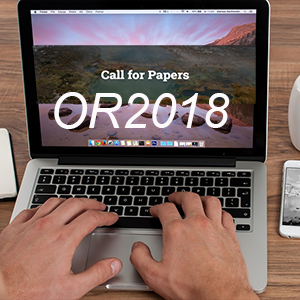 The OR2018 proposal templates help you prepare an effective submission. Please select the submission type from the below to download the templates. Templates are available in Microsoft Word, Plain Text and RTF.